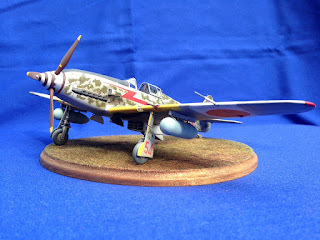 "This is my just finished 1/48 Hasegawa Ki-61 Hei. I originally started this kit when brand new in 2005, and it came off the "shelf of doom" in 2010 and again in 2016/17. 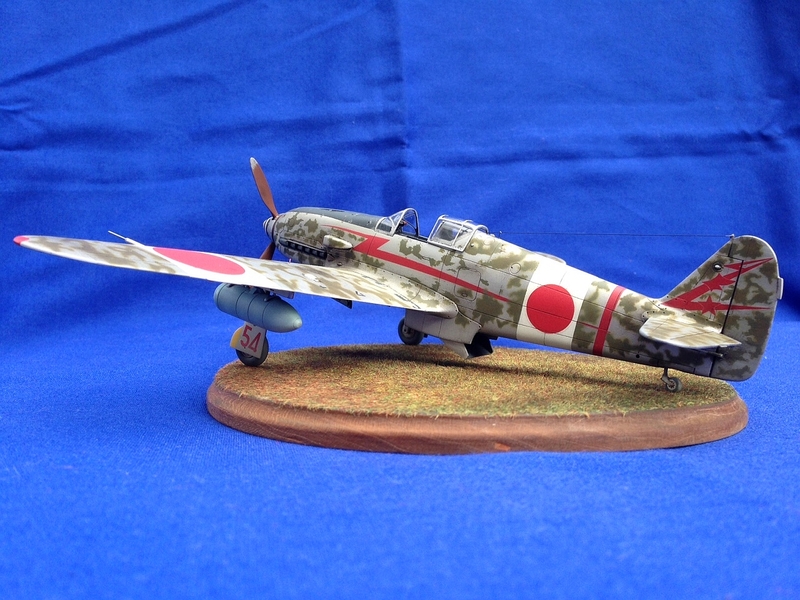 The Hasegawa kits are still very nice, and in fact are the only game in town for the short nosed Ko/Otsu/Hei variants. Three areas of weakness are the lack of wing dihedral, the poor shape and detail of the supercharger intake, and the lack of a multi-piece canopy. I improved on all three areas of this kit. "The natural metal finish is airbrushed Floquil old silver and platinum mist. After curing the paint was progressively wet sanded with automotive grade sandpaper to get a smooth and shiny surface. All other colors are Gunze Mr. Color lacquers, except the drop tanks and camouflage mottle which are custom mixed Vallejo acrylics. 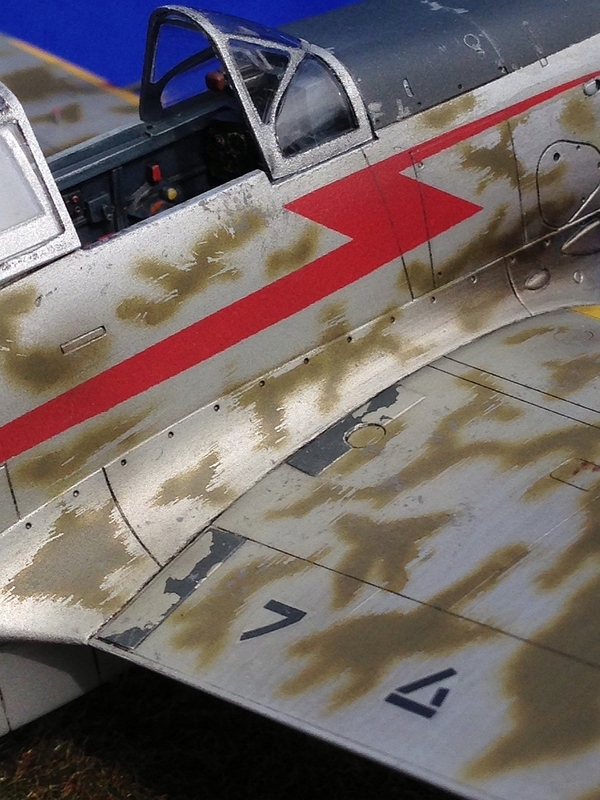 Weathering was applied with artist oils for panel washes, and Vallejo acrylics for the dust/dirt and paint chips. 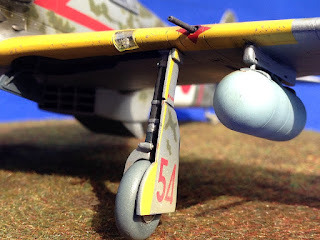 The final clear coat is Gunze Mr. Super Clear matt applied from a spray can.Eduard photoetched lap belts were added, as well as minor items like brake lines from copper wire and landing gear indicators from brass wire. "Careful study of close up images show the subtle yet apparent scuffing and dirt/grime from ground crew on the wingroot areas. "Decals are from the Lifelike Decals 244th Sentai collection. 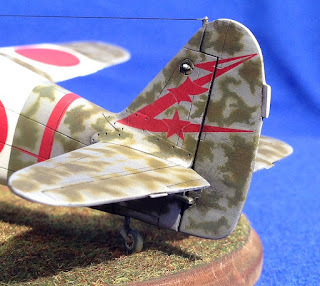 When originally started, this model was planned to represent an aircraft of the 68th Sentai based in New Guinea, but finding a black and white image of this particular aircraft made me change my mind. 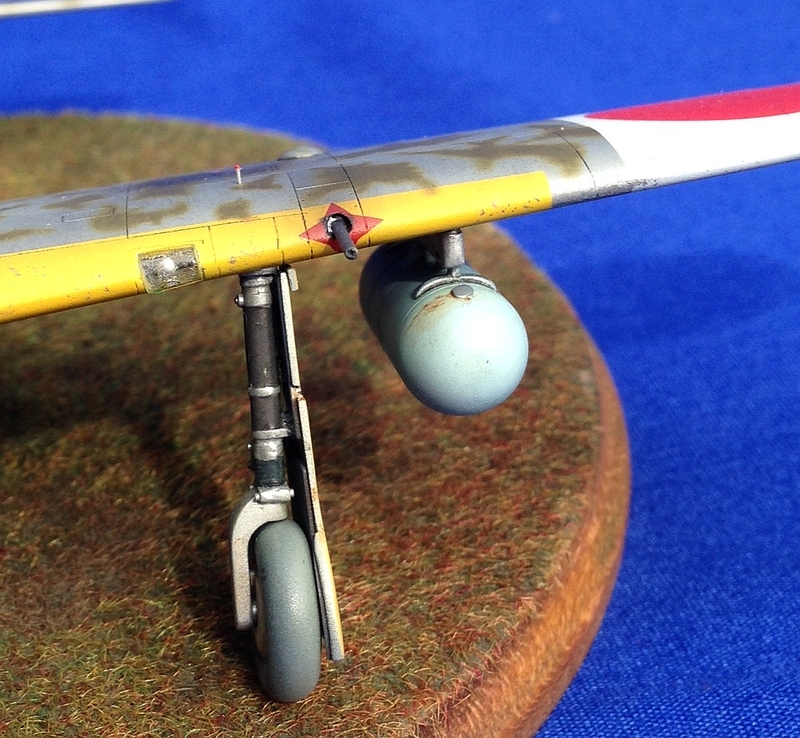 The early build Hiens had a dark blue/grey color in the cockpit and landing gear bays, which is replicated on this model. 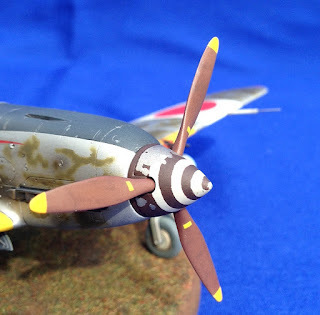 If I had started this project knowing how it would finish, I would have opted for the sand brown color seen in later build aircraft!" 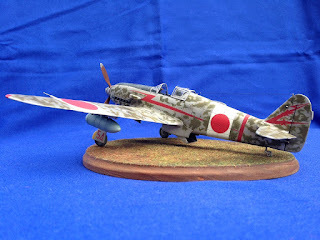 With special thanks to Dan for sharing these images of his superb and convincing model with Aviation of Japan and providing the write-up. Very nice Dan! Question, did the photograph that inspired you have the spiral stripe on the spinner? I don't ever remember seeing that on any drawings or pics of the Ki-61. Thanks for the kind words! Yes indeed the image did show the spiral, even to the point of the paint wearing off the spinner. That, plus the lightning bolt caused me to change direction on the model. 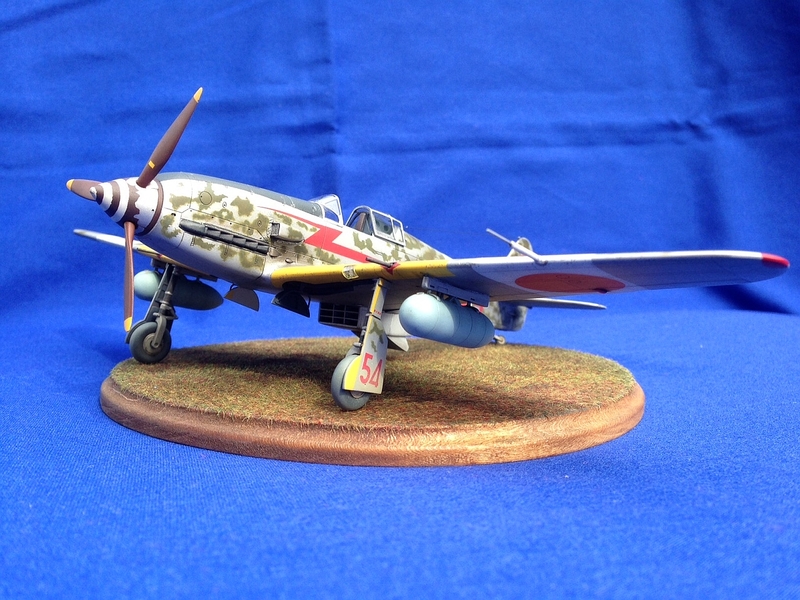 There was also a color side profile from Shigeru Nohara and he depicted the spiral as yellow, but comparing the shade to the wing IFF felt that white was a better interpretation. did you use the Squadron Vac Form Canopy for this model , please ? 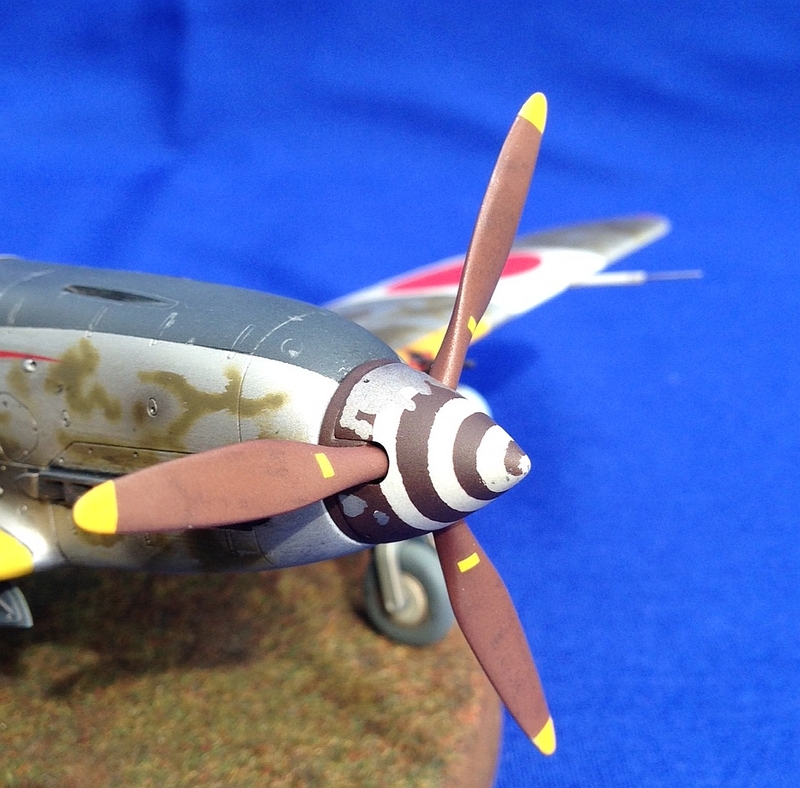 overall , your amazing modelling paint style is very impressive ! That's exceptionally well done Dan. The combination of those Floquil metallic paints is one of my favorites and gives a most realistic patina. How did you do the green camouflage? 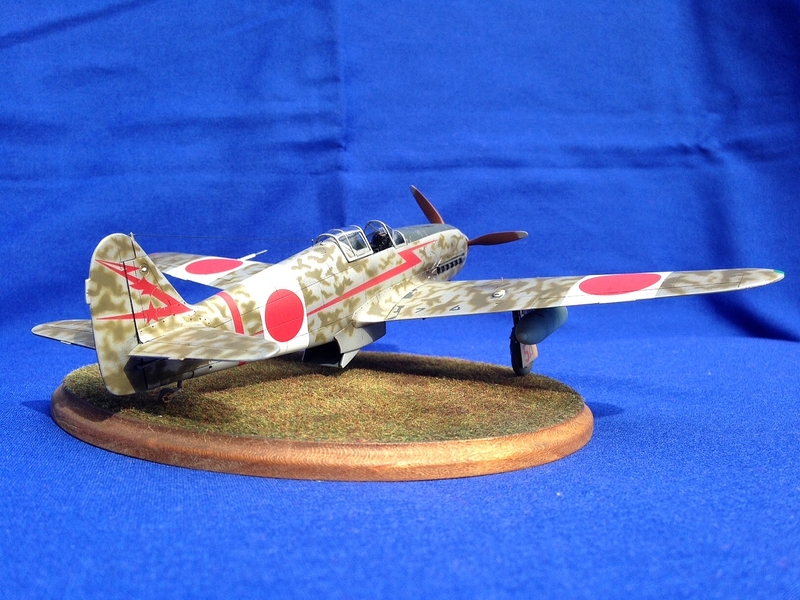 It is the best I've ever seen on any Ki-61. Thanks again for the kind words, they are greatly appreciated coming from members of this group! I had originally used the Squadron vacform canopy, had masked and painted the clear parts back in January. By the time I got around to removing the masks in July, the tape also removed the paint from the vacform part (but the kit windshield and rear portion were perfect). Rather than risk an issue on a repaint, I scavenged the same part from the new Tamiya kit and used the masks included in that kit. 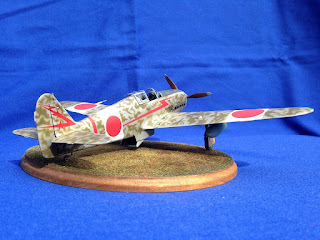 Once I get around to building the Tamiya kit, will use the Squadron part on that model. I airbrushed the green camouflage with my Iwata HP-C, and once it had cured for a few days, wiped ever so gently with a tack cloth to scuff and "weather" the appearance. Even a gentle swipe with 8000 grit automotive sandpaper removed the Vallejo paint (see my comments in Nick's post about the Vallejo IJN and IJA color sets). I'm running low on my Floquil silver enamels and unable to find more, even online or at hole in the wall model railroad shops. 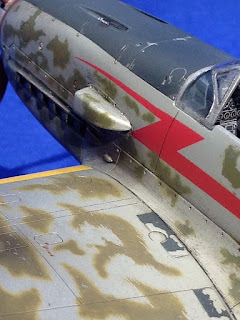 I have read great things about the AK Interactive Xtreme metal paints (also enamels) and will try them on whatever NMF aircraft I build next. Very impressive and challenging marking on spinner. Elaborate and realistic finishing on the whole surface as well ! Very fine job indeed!! Great work with your airbrush, as well. I would only better the trailing edges - I usually reduce them down to knife sharpness, it makes look the model more realistic. Looking forward to see your next Hien! Thanks for the kind words, Danilo! Your work always sets a high standard. Besides details, your models seem to reflect careful study of photographs. I really love this one! Thanks for the very kind words Mark, they are truly appreciated!